Summary: Smart People doesn’t seem particularly smart at all. A film about the intelligent behaving foolishly, Smart People has echoes of Sideways and The Squid and the Whale. Yet it’s substantially less satisfying than either, undoubtedly because it lacks their warmth and feels so depressingly calculated. Long too. In the UK, we’re criticised for not discussing our feelings. But you couldn’t make a British film as stultifying as this, about such repressed characters, without introducing a little more leavening wit. Smart People is not without its humour. Too often though, the comedy feels self-consciously quirky, in the worst tradition of US indie cinema. Add to this the most intrusive, overwrought score I can recall and the viewer is left wondering why they should care about these abrasive people. Looking suitably crumpled, Dennis Quaid is Lawrence Wetherhold, a burnt-out, miserable English professor at Carnegie Mellon University, who’s been busy retreating from life ever since his wife died. Lawrence loves literature, having written a misanthropic critical tome that no-one wants to publish, but he has no time for his students and scarcely more for his children. James (Ashton Holmes) seems reasonably well-adjusted. 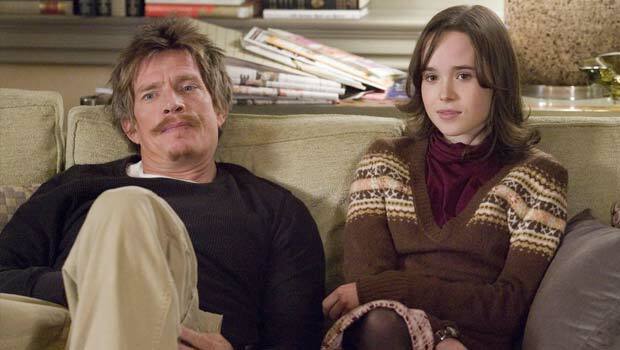 But older-than-her-years, friendless Vanessa (Ellen Page, in a part she took before Juno) is an ultra-committed student and Republican who’s taken her mother’s role in the family home and is constantly seeking her father’s approval. Into this dysfunctional family arrives Chuck (Thomas Haden Church), Lawrence’s sponging adopted brother, who will, you immediately realise, be instrumental in sparking his renewal. Indeed, when Lawrence suffers a fall attempting to retrieve his briefcase from a car pound, Chuck becomes his unreliable driver. As it turns out though, this slob’s presence has more of an impact on the uptight Vanessa. Recovering in the ER, Lawrence is reintroduced to Janet Hartigan (Sarah Jessica Parker), a former student he can’t remember, but then he can’t remember any of his student’s names. His harsh assessment of one of her essays prompted the doctor to switch her major from English to biology, yet she used to have a crush on him and is persuaded to meet Lawrence for a less than successful date. After a false start, they eventually get it together. But theirs, like every other relationship in this film, doesn’t progress at a believable rhythm. The periodic bust-ups invariably feel like routinely paced plot developments instead of recognisable character growth. Quaid is watchable enough as the alternately pompous and defeated Lawrence, as is Parker as the lonely doc letting herself in for more than she bargained for, even if there’s little chemistry between them. Page presents many of the mannerisms and sarcastic turns of phrase she showed to such good effect in Juno and should probably harbour concerns about typecasting. She’s perfect for this role though. Nevertheless, it’s Church that keeps Smart People from boring to tears, his likeable loser played with a lightness and sureness of touch that you wish had been applied to the rest of the film. Regardless of whether they’re satirising or sympathising with the intellectual elite, director Noam Murro and writer Mark Poirier show precious little respect for the brains of their audience. Does Vanessa really need a framed photo of Ronald Reagan in her room to tell us she’s a staunch Republican? Does Chuck have to be introduced photocopying his private parts to illustrate he’s the black sheep of the family? Smart People doesn’t seem particularly smart at all.